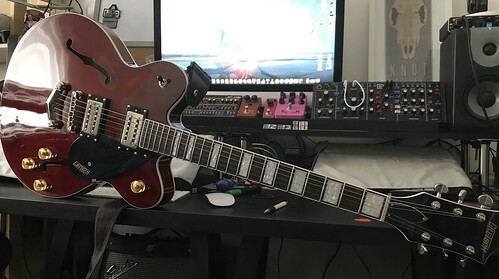 I picked up a Gretsch Streamliner in a trade while I was clearing out a load of stuff I don't se anymore (this was traded for an iPad i bought to use on the plane on holiday that hadn't been touched since). The guitar is most likely going to be fitted with a pair of Gibson P90s (spare set) and a set of Grovers but I'm struggling with what to switch out the ugly knobs for. Option 3 you tell me? Any combinations you've used/seen that are cool. I do like the silver ones but have them on my other one so I'd like to do this one a bit differently. What's the neck like on these btw? The perfect mix of chunk and playability, similar carve to o the older/better quality Korean and Japanese Epi semi hollows. You can get them for a great price preowned and they're a solid modding platform. Semi hollow centre block to keep down the weight and keep the feedback away.